Today, in contrast to just about every day since the fall, is very nice: sunny, temperatures verging on +50 F. I decided to walk and did so—for the first time in weeks—for a very pleasant hour or so. The sidewalks were almost entirely clear of ice and snow is melting everywhere. 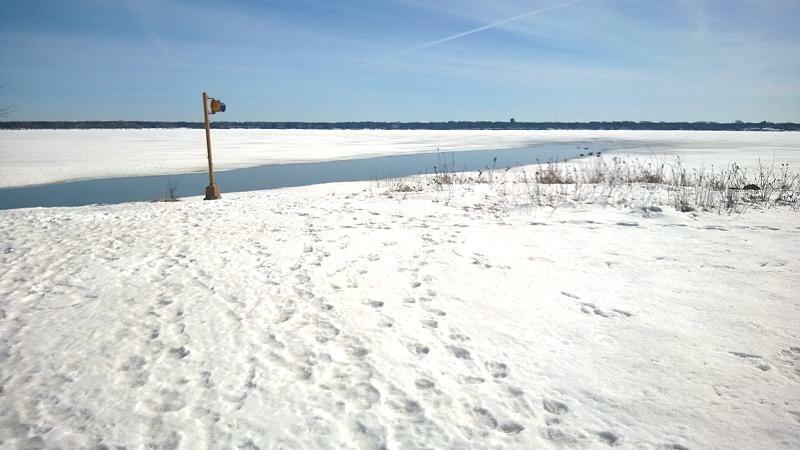 I walked out to the Yahara along the north shore of Lake Monona. This is what I saw when I reached the river. The Lake is still frozen but the river is open. My return was along Williamson Street. When I got to Capitol Square I decided to go through the State Capitol Building on my way to lunch on State Street. Since it was the noon hour the rotunda was occupied by the Solidarity Singers, a group that has gathered there just about every noon hour ever since the failure of the vote to recall Governor Walker. They have become a community, gathering every day, singing their protest songs, and many breaking up into lunch groups afterwards. They sing songs with their own words to familiar tunes—many of them old union songs. Today I was somewhat shocked (although I shouldn't have been, this being Madison) to find them using the tune of The Internationale, a song that, whatever its origins, one would have thought forever tainted by its association with the USSR, Stalin, Mao, Pol Pot, et. al. I thought perhaps I should suggest The Horst Wessel Leid, another revolutionary song with a memorable tune. I suspect my point would have been missed.